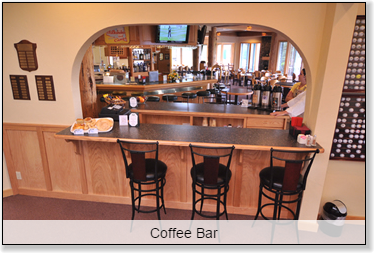 The Coffee Bar offers a continental breakfast from opening until 11 a.m. Freshly baked pastries, muffins and a hearty French roast coffee are some of the items available. Lunch is served beginning at 11 a.m. until 4 p.m. Satisfy your hunger with appetizers, Angus burgers, sandwiches, salads or the Chef inspired soup of day. 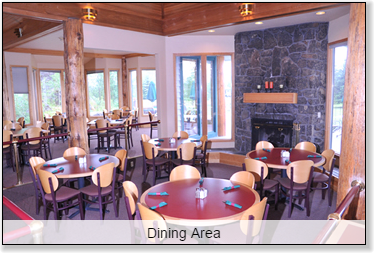 The Grill offers both indoor seating as well as outdoor patio dining. 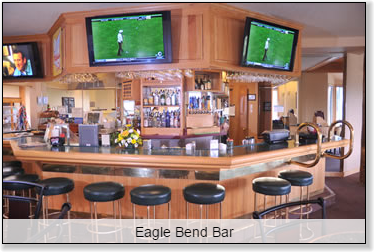 The lounge is a full service bar where the sports are always on! Served with your choice of French Fries, Chips, Side Salad, Cup of Soup, Cottage Cheese, Cole Slaw, or Fruit Salad. A 1/3 pound Angus patty on griddled marble rye with Swiss, cheddar, sautéed onions, and pickle chips. A vegetarian whole-grain burger, served on a toasted whole wheat bun with fresh leaf lettuce, tomato slices, red onion slice, sprouts, and a kosher dill pickle spear. A freshly baked croissant with our sour cream ranch spread, bacon slices, smoked turkey, avocado, leaf lettuce, and tomato. Features thinly sliced deli style smoked turkey, leaf lettuce, sliced red onion, alfalfa sprouts, and cranberry cream cheese on griddled honey whole wheat bread. Whole wheat bread with our handmade roasted red pepper pesto, sliced avocado, cucumbers, fresh leaf lettuce, tomato slices, red onion, and alfalfa sprouts; served with a kosher dill pickle spear. A juicy char-broiled chicken breast topped with your choice of cheese, served on a hoagie roll. Served with fresh leaf lettuce, tomato slices, red onion slice, and a kosher dill pickle spear. Toasted sourdough bread loaded with smoked bacon, fresh leaf lettuce, tomato, and mayonnaise. Roast beef, sautéed mushrooms, and provolone cheese stacked on a hoagie roll. Served au jus with a kosher dill pickle spear. Thin-sliced pastrami, Swiss cheese, warm sauerkraut, and 1000 island dressing piled high on griddled marble rye bread. Honey cured ham and your choice of cheese on griddled sourdough bread. Cheddar, Swiss, and provolone cheeses on griddled sourdough bread. Your choice of turkey, ham, roast beef or pastrami; Swiss, cheddar, provolone, or pepper jack cheese; whole wheat, sourdough, or marble rye bread; served with leaf lettuce and tomato, kosher dill spear on the side. Mixed greens topped with breaded diced chicken tenders, diced tomatoes, diced hard-boiled egg, shredded cheddar and Monterey jack cheese, julienne red onion, and diced green onion. Served with your choice of dressing. Mixed greens with mandarin oranges and raisins topped with a special mixture of warm spicy peanut sauce, char-broiled chicken, sautéed red onion, celery, mushrooms, and cashews. Garnished with crispy chow mein noodles.